String art is the process of creating three-dimensional designs with wood, string, nails, and math. This fun art form allows you to create anything from words to pictures either freeform or with patterns. Try this easy art form to create something new. String art is done on a hard surface such as a board or cork tile. This surface is your canvas; the finished product is meant to be hung on the wall to be displayed when you're done. Prepare your board by sanding the edges and staining if desired. Let any fresh stain dry completely. Center your pattern on the board and tape down the edges so it remains in place. It helps to make your pattern slightly larger than you want the finished design to be to give you room to add the nails. Alternatively, you can also trace or draw the outline of your design right onto the board. Hammer in the nails or tacks around the perimeter of your pattern or design. Set the nails about 1/4-inch inside the pattern and follow the edge. Keep the nails about 1/2-inch apart from one another to give yourself enough room to wrap the string. Remove the tape and pull the paper pattern off of the board. Once your canvas is prepared, it's time to apply the string that will make your design pop out. Depending on the pattern or design you're creating, you may want to use one or several different colors of string. Find the starting point of your pattern. Most math-based patterns will have a specific sequence you will need to follow to produce the design. If you are doing a freehand, abstract, or "design within a design" pattern, start anywhere you feel comfortable. If you are working from an image within an image, start on the interior row of nails. Tie the string securely onto the nail. Apply a small dab of hot glue onto the string and nail to keep the string from spinning around, and to help secure the string firmly to the nail. Pull the string taut and stretch it across to the next nail indicated by the pattern. If working freehand or doing an abstract design, consider trying several nails to see which fits your design best. Wrap the string firmly around the nail once and stretch it toward the next nail indicated on the pattern. If you are working freehand, move on to whichever nail best complements your design. Continue pulling the string taut and wrapping it around the nails, moving around the pattern. If you are doing a freehand pattern or a pattern with several components, you may want to tie off the string and switch to a second color. Use a dab of hot glue to tie off the string securely and keep it from sagging. 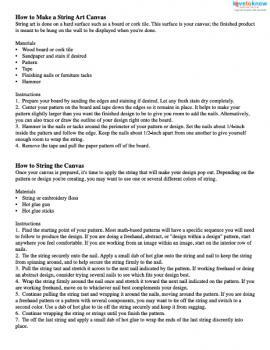 Continue wrapping the string or strings until you finish the pattern. Tie off the last string and apply a small dab of hot glue to wrap the ends of the last string discreetly into place. There are so many different patterns and ways you can create string art that it's hard to do it wrong. To help make the most of your art, however, try using some of these tips. Consider using a ruler and a colored pencil on paper to create the design or follow the pattern first. This will allow you to feel comfortable with the pattern, determine colors, and finalize any abstract or random designs. Make your own designs using graph paper and a ruler. Transfer the finished pattern right onto your canvas when you get it right. Use soft craft plywood or cork for your canvas. Avoid birch plywood and other hard surfaces which will be difficult to get your nails into consistently. Play around with string weight. Try separating out strands of embroidery floss to make a more lightweight pattern. Frame your finished art before hanging it. This will help prevent the nails or string from pulling loose. String art is a fun way of using geometry to create some art. Try your hand at a string art pattern and create some unique wall hangings.